A US court has allowed teaching yoga in a Southern California district school as part of curriculum, rejecting the petition by parents that the ancient Indian practice is promoting Hindu religious beliefs. San Diego Superior Court Judge John Meyer on Monday ruled that the yoga programme of EncinitasUnionSchool District does not endorse any religion. As such the judge rejected the plea of a section of parents of schools that the EncinitasUnionSchool District in San Diego by providing instruction in Ashtanga yoga, is promoting religious beliefs. The law suit was filed by The National Center for Law & Policy on behalf of the parents. The 30-minute programme in Encinitas, funded by the Jois Foundation, is composed of stretching and breathing exercises and is designed to help keep students active while learning basic relaxation techniques. While the Jois Foundation is a proponent of Ashtanga yoga, an eight-limbed practice based in Hindu philosophy with the ultimate goal of moksha, or liberation, the programme for public schools is stripped of spiritual teachings, chanting, and even the Sanskrit language. For example, the lotus position was renamed the "crisscross applesauce" pose. "This case is not about whether yoga has health benefits, whether individuals may personally practice yoga, or whether individuals like or enjoy yoga. "This case is simply about whether public schools may entangle themselves with religious organisations like the Jois Foundation and use the state's coercive powers to promote a particular religious orthodoxy or religious agenda to young and impressionable school children. Religious freedom is not for sale to the highest bidder," Broyles said. "This is not the end of the road for this case or the last word regarding the fate of yoga in public education-this is only the beginning," he said in a statement. The lawsuit was the result of the EncinitasUnionSchool District's decision to accept $533,720 from the K P Jois Foundation. 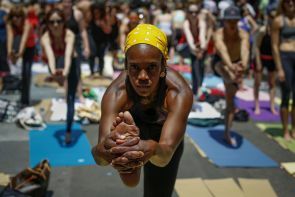 Image: People take part in a group yoga practice in New York's Times Square.